10 must sees in Yogyakarta, Java! If you are visiting Java in Indonesia you simply can not skip the ancient Buddhist temple Borobudur in central Java. When planning a visit to Borobudur it is great to stay in Yogyakarta (Yogya), a bustling city with a lot of culture, art and modern influences. Since Yogya has an airport it is easy just to fly-in from Bali for a few days of sightseeing. You can also fly to Jakarta and take the scenic (but long) train-ride to Yogyakarta if you have more time to spend on Java. If you are wondering how to organize a trip to Yogyakarta you are in the right place. Let me give you the 10 must sees of Yogyakarta, useful information about those highlights and tips for transportation and accommodation! 10 must sees of Yogyakarta! 1. Learn the history of the Prambanan temple complex around sunset! The biggest Hindoe temple dedicated to Shiva in Indonesia is the Prambanan Temple. The area consist of over 500 temples and ruins. Quite a lot of piles of monumental stones can be found on the compound that needs to be restored after the latest earthquake in 2006 and previous collapses. It is impressive to see how some temples are still standing up without the use of concrete, like the game Jenga. Shiva, Vishnu and Brahma have their own temple with the animals who serve them in a separate temple close-by. It is really nice to visit Prambanan around sunset, although we had quite a lot of clouds. It is a great photo opportunity and it is cooler. I would also recommend hiring a guide here, although the Ramayana story is also partly explained at Borobudur. With big tourist attractions come big sales opportunities for souvenirs, expect the same souvenirs in about 200 shops built up as a maze. Since we wanted to save some money we ordered a meter taxi from Yogyakarta. Once we wanted to go back, after sunset, there were no taxis anymore and no possibility other than an engined trishaw / becak that would take up to one hour. Since the seats are quite often not wide enough for two foreigners to sit comfortable we decided to walk to the main street. As soon as we started walking people offered us help and organized private transport as in a friend/family member, getting some commission. This was not the cheapest option for sure, but we got home comfortably. 2. 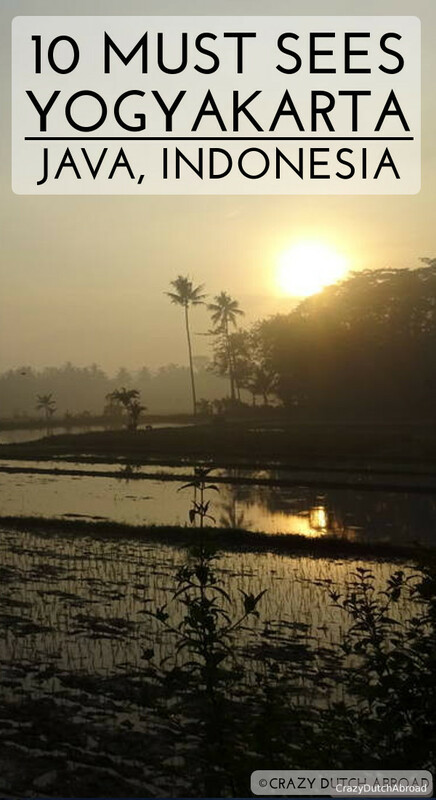 Wake up early for the Punthuk Setumbu Borobudur Nirwana Sunrise Experience! 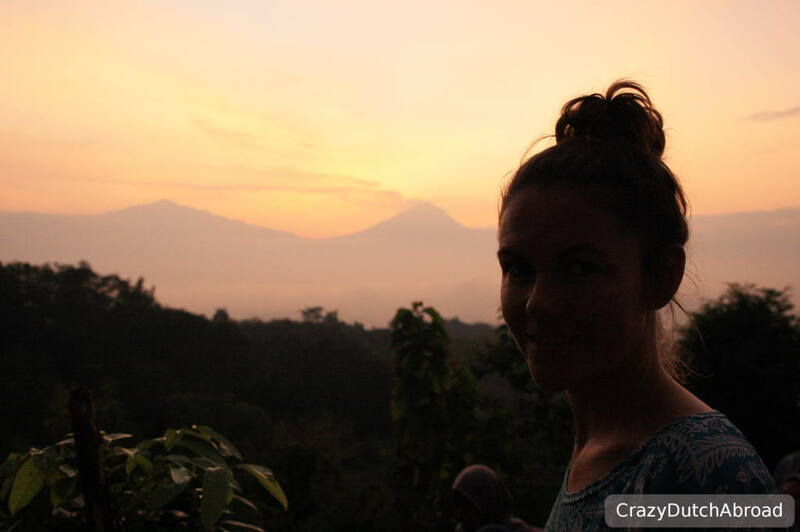 Since we wanted to go to Borobudur early, we decided to go for the sunrise! We thought it would be nicer to view sunrise behind Borobudur than to see it from within (see 3) and this was more or less free. At 3 AM we got up in Yogjakarta to drive to Punthuk Setumbu. Of course, we were not the first ones, so they sold hot coffee! Since I am an espresso lover coffee addict, black and strong coffee without sugar is the best! Without sugar was possible, but it was a pre-mix... Not the best start at 3:30 AM, but the sunrise made it all good! On our way to Borobudur we drove through the rice terraces, amazing views again! 3. Explore the Borobudur temple with a guide! This UNESCO World Heritage site is one of the greatest Buddhist monuments in the world. It is huge and contains three layers; a pyramidal base with walking terraces telling many stories, three round platforms with openwork stupas with a Buddha statue inside (you can not touch!) and a closed stupa on the top. The whole temple is built around a hill, so expect to climb! Normally I am the last persons that is interested in hiring a guide but here it is well worth it. One of the things I really loved was the detailed explanation of the path of growth when someone attains Buddhahood which is represented in the structure, especially the stupas where the openings change towards the top. TIP: Go as early as possible to escape the heat and crowds! You can enter the park before sunrise, from Manohara Hotel at about 4:30 AM. This can give you amazing sunrise photo shoot right over the stupas without crowds but you pay a lot extra. As a foreigner you pay extra, but you get a FREE coffee/tea! There is a combined ticket for Prambanan and Borobudur for 32$ (save 6$) to use within 2 days, you can not combine this with a Manohara Borobudur Sunrise ticket. We were there with huge groups from different schools and they loved taking pictures of us. I learned about being BBL! Blond, Blank & Long! Ideal for 100 selfies and competing with this World Heritage Site! 4. 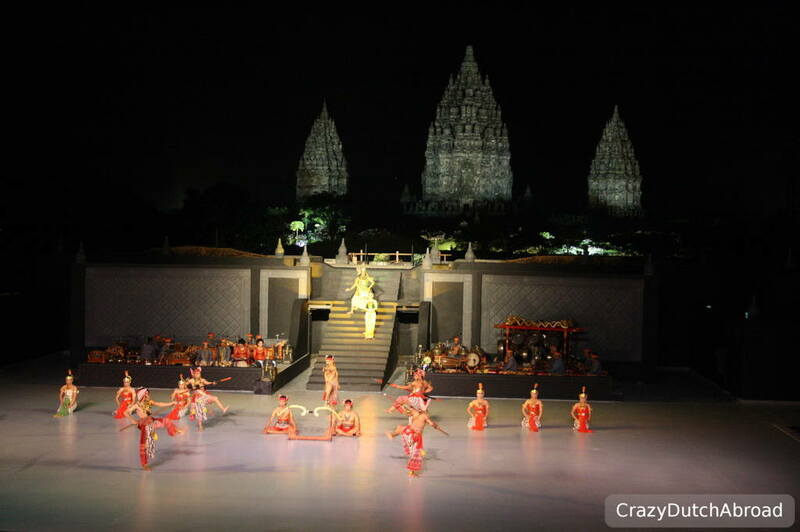 See the story of Ramayana performed by the Ramayana Ballet in Prambanan! If you have been visiting Borobudur and Prambanan, you have probably heard a lot about the Ramayana story already. In short it is about the story of King Rama and his wife Sita. Sita gets abducted by King Ravana of Sri Lanka and Hanuman, the white monkey, plays an interesting part with his monkey army. 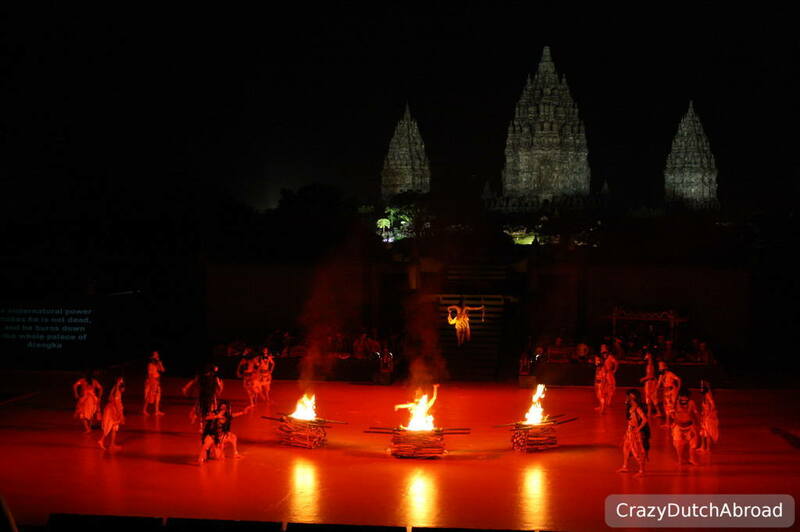 The traditional story is preformed by the Ramayana Ballet in two locations; Yogjakarta (Purawisata) and Prambanan. Check the schedules because it is not every day and sometimes an episode of the story is performed instead of the full story. We went to Prambanan as this is an open air theater with the Prambanan temples in the background (from May to October). Also we were advised that the Prambanan ballet is performing with way more dancers and musicians (up to 200) and in a larger theater. The show was beautiful, the story was clear and the costumes were impressive, but - I have to say - the first part was a bit slow. After the break the real spectacle begun. The show is from 7:30 to 9:30 and your seats are reserved so you do not need to hurry for the best place to sit. TIP: Make sure to make a reservation for the show to get good seats. We bought the SPECIAL seats and we were really happy with this. There are 4 seating classes, the cheapest two include sitting on the side of the theater with the temples in a 90 degrees angle and no pillow (just concrete). You can combine the ballet with an Indonesian dinner buffet. In Prambanan the Prambanan Garden Resto is right next to the entrance of the ballet and in front of the temples. Around sunset you have a great opportunity for taking pictures! You just walk in and pay the dinner separately, 92.000 Rupiah per person. Here you can order a Bintang beer with your dinner, inside the theater you can not buy any alcohol. 5. 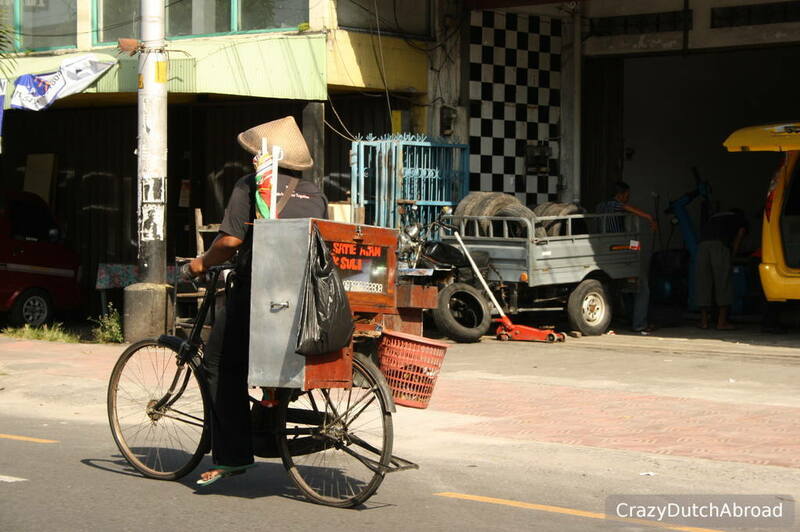 Enjoy the bars & restaurants in Jalan Sosrowijayan (Wetan)! Now this is really a nice back-alley of Yogjakarta, many cozy sit down restaurants and bars serve all kinds of foods. If you are a daredevil, try the snake menu at Mi Casa Es Tu Casa. They serve python and cobra in drinks and dishes! Bedhot Resto has a nice terrace on the second floor and the place is wonderfully painted. The alley is called Jalan Sosrowijayan Wetan. If you walk around the corner, Jalan Sosrowijayan, you can find the bar Lucifer - also recommended for cold beers! Jalan Sosrowijayan Wetan, flamed snake dish at Mi Casa Es Tu Casa and Lucifer Bar & Resto. 6. Walk around the Taman Sari Water Palace! This water alace was build as a garden for the Sultan of Yogyakarta in the 18th century. It lays in the Kraton (palace) area. There are many different pools with fountains and garden areas with fruit trees around the area. The area has not been renovated and is partly taken over by the village. Have a look at all the decoration details. 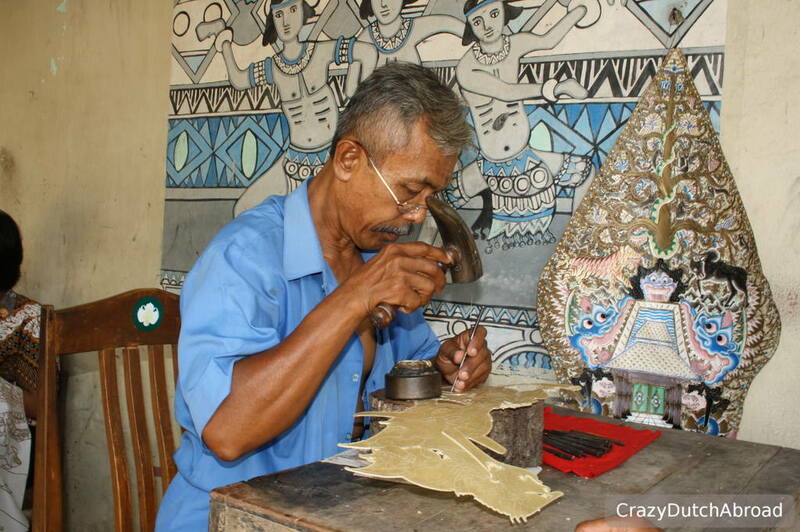 There are some shops with batik as well and a man was making beautiful wayang shadow puppets. Taman Sari, the water palace of the sultan. 7. Shopping at Jalan Malioboro! Batik and art galleries as well as cheap souvenirs can be found in the busy and colorful 'tourist' market along Jalan Malioboro, Jalan means street! It is really nice to stroll through the market of little shops or just take a trishaw / becak or horse carriage. There is a shopping mall for the rest of your shopping needs. 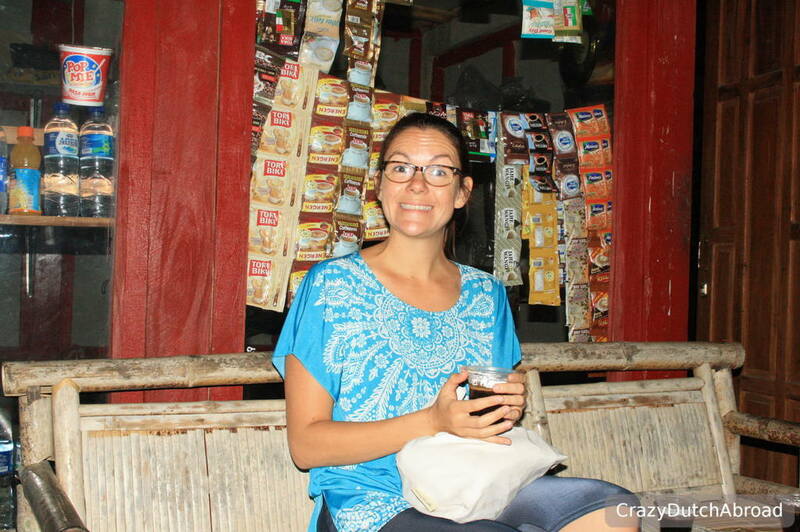 TIP: One piece of advice about batik in Yogya, do not believe the art academy stories! 8. View the skyline of Yogyakarta! The skyline is not that interesting but I always love to have an overview when I visit a city for the first time. You can visit the sky bar of Hotel Neo Malioboro for free if you order a drink. They serve cold Bintangs and mocktails! If you would like to stay in a fancy new hotel, this is also the place. Brand new, futuristic design and a wonderful rooftop terrace. As outside guests you can also have an amazing breakfast buffet for 100.000 Rupiah with an egg and waffle station for example. The skyline of Yogyakarta from Hotel Neo Malioboro. 9. Royal dining at Bale Raos Restaurant! Have you ever had dinner in a palace area? Bale Raos Restaurant is right inside the Kraton area. This garden restaurant is decorated and built in traditional Javanese style and has live music. 10. The royal history explained in the Ullen Sentalu Museum! If you like to know everything about the Sultans and royal member of the past, the private Museum Ullen Sentalu is the place to watch and learn. You can only enter with a guided tour. The guide will explain everything from A to Z. Inside you are not allowed to take photos. This tour takes up to one hour including a free drink. The outside of Museum Ullen Sentalu. There is a beautiful restaurant built on top of the souvenir shop, they do not serve alcohol and the prices are quite high. The ride from Yogya is about one hour and it is quite hard to combine it with other interesting things. TIP: Do not take a one-way trip from Yogyakarta.There are no taxis around this place, they have to call one from Yogyakarta to come and get you (which takes an hour). Let your driver wait! So, as you have read we got stuck a few times because we did not want a driver for the day. There are two reasons why we did not want a driver for the whole day, because most of the times you have to do some commission stops and because a meter taxi is a lot cheaper in general. We hired a private driver for the sunrise at Punthuk Setumbu and Borobudur in one go and a separate return to the Ramayana ballet with dinner. With four people we paid 250.000 Rupiah and the driver waited at those places. This was really nice. 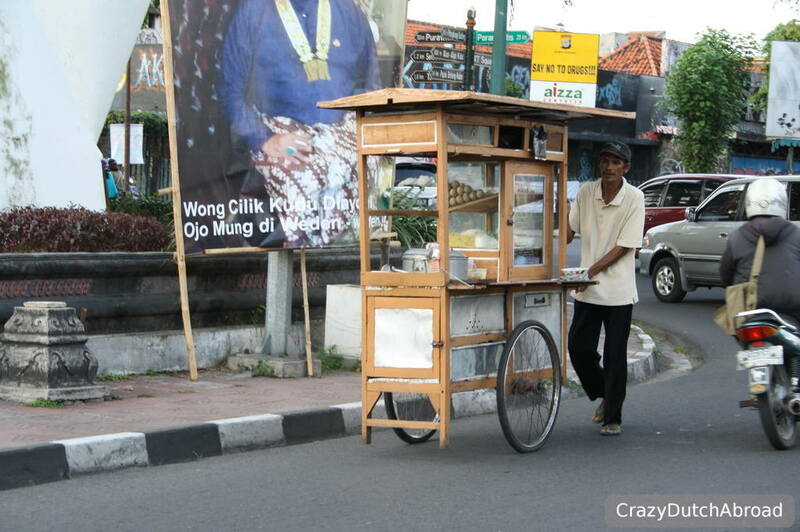 Yogyakarta city with many mobile hawkers and trishaw / becak (taxi bicycle) drivers. What I really love about selecting a place to stay is to find out in what area it is nice to stay with easy access / walking distance to some highlights. We stayed close to Jl. Malioboro to be able to walk to the shops and restaurants, get quick transport access and Jalan Sosrowijayan Wetan is around the corner. Istana Batik Ratna hotel is a small boutique hotel with a swimming pool and restaurant. 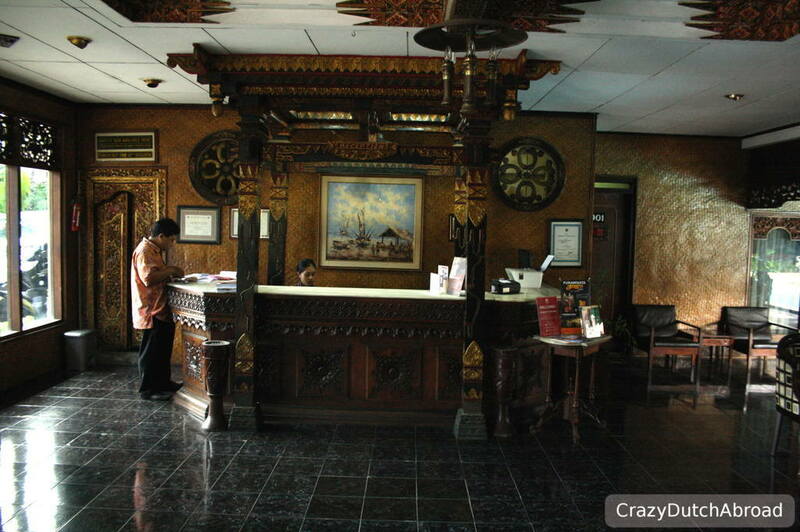 It is an old building with traditional carved and painted wood decorations and batik all around. It is located where the yellow star is on the map. Some of the must sees mentioned above are marked red. You can see that we hit the right spot here! 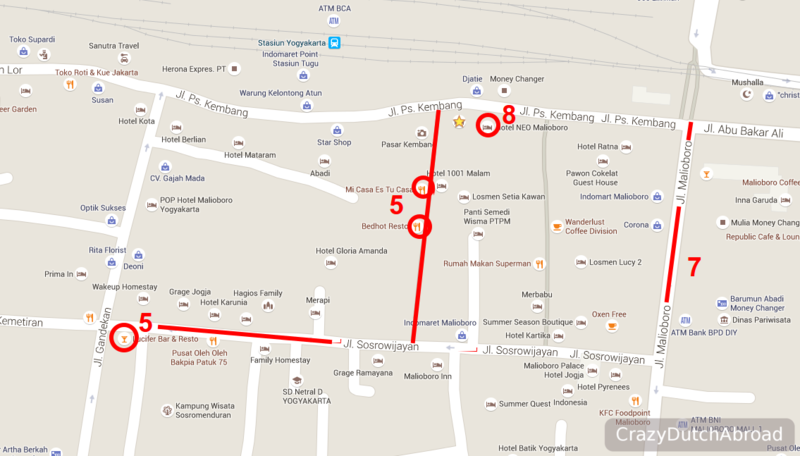 Hotel Neo Malioboro is next door, number 8 on the map.